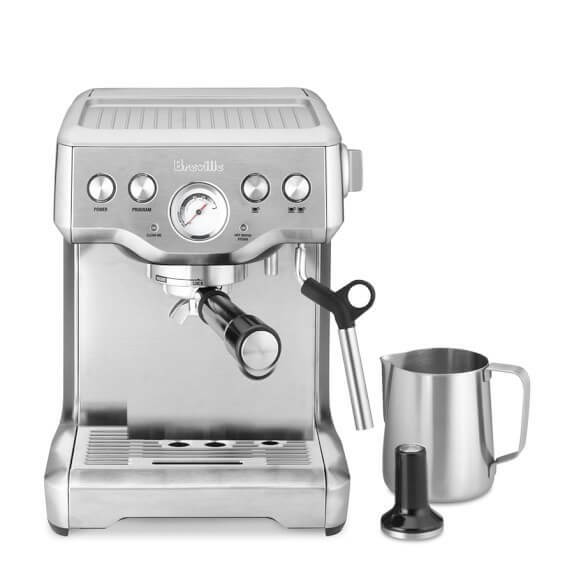 Ever heard of Breville Infuser Espresso Machine? It’s not that much popular machine but it does makes perfect espresso at a very low cost. There are plenty of low-priced espresso machines on the market: you can even get them for under $100! These are great for people who don’t want to risk a whole lot of money on a gadget that they may or may not end up using every day. But if you’re a dedicated home barista and are looking to upgrade, it’s nice to know that you can still get a good machine that’s reasonably priced. With $500 or less, you can buy a machine that will do everything you’re likely to want a home espresso maker to do for you. In search for an espresso machine for home under $500, we found several machines with a lot of good points to recommend them. But for durability, ease of use and all-round quality, nothing beats the Breville Infuser Espresso Machine. It’s full name is actually Breville BES840XL Infuser, which seems ted long, so we will be continuing with just Breville Infuser. Espresso machines can be complicated beasts to deal with, especially when you haven’t had your first coffee of the day! The Breville Infuser keeps things simple by speaking your language: when the machine needs de-scaling, the “clean me” message will light up, and when the drip tray is full, an “empty me” sign pops into view. If only my laptop’s error messages were so straight forward! The Infuser also makes it as easy as possible for you to pull great espresso shots. You will have your choice of pre-programmed brewing or manual override, as well as a choice of pressurized or non-pressurized filter. If you’re still working on your barista skills, you can choose the easier options and still get excellent results. The Infuser takes its name from the pre-infusion function at the beginning of the brewing cycle. The machine uses low water pressure to expand the grounds before brewing, evening out any irregularities or gaps so that even pressure can be applied for extracting. If you’re still trying to figure out how to get the right grind and tamp pressure, this will really help you get more consistent results. What really sets this machine apart is its robust PID controller and thermocoil. Unlike earlier models, the Infuser’s coil is robust and solid, providing all the heat you need for good extraction. Unfortunately you can’t change or control the temperature, but the good news is that the water temperature is reliable and consistent. You will never have to wait between pulling shots and steaming milk: the machine provides a steady stream of water at the perfect temperature. The machine is programmable for single and double shots, but you also have the ability to manually override the programming if you prefer to time your own shots. The Infuser also gives you hot water on demand for tea and Americanos. Note that the hot water comes out of a separate spout instead of the steam wand as with most espresso machines which is again a unique attribute to count. The pressure in the steam wand itself is a bit on the low side, making steaming your milk a slow process, but you do end up with a good amount of fine foam. Considering its price, the Breville Infuser comes with a lot of extra features and accessories. You will receive 4 filter baskets, giving you the choice of pressurized (dual wall) or non-pressurized (single wall) baskets for both single and double shots. 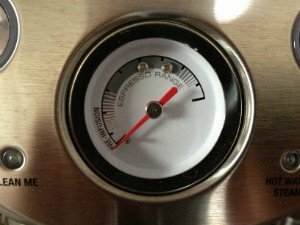 These options allow you to brew great espresso shots even while you’re still developing your barista techniques. The Infuser also includes a number of convenience features. It comes with a tamper that attaches to the machine magnetically, so you will always have it close at hand. You can keep your portafilters, filter basket and scoop in a hideaway storage area behind the drip tray. The ball joint on the steam wand is a nice feature. Again, it won’t make a difference to the taste of the final product, but it does make it easier to manoeuvre the frothing pitcher into position. If you hate wet coffee grounds splattered all over your kitchen counter, you’ll love the “dry puck” feature on this machine. Excess water is removed from the grounds after brewing, so you’ll never have to worry about a sloppy puck messing up your knock box. This model also features a sleep mode and automatic shut-off for added peace of mind. With all the accessories and features, it is perfect to say that this is the best espresso machine under 500 bucks. No machine will meet every single customer’s needs perfectly. As popular as the Breville Infuser is, there have also been some complaints about it. It’s not a solid, heavy machine. For some this might be an advantage, but other owners don’t like the fact that it may move a bit on the countertop when they attach the portafilter. It’s a minor complaint, but if you are looking for a big, solid machine that feels like a commercial model, the Infuser is not going to make you happy, after all the commercial one’s also cost a fortune and are not meant for home use. Some people have also complained that the pressure gauge doesn’t always work. The machine is under a one-year warranty and will be replaced if any part of it is defective, but the pressure gauge seems to be the one feature that fails sometimes. It’s also important to take the “clean me” message seriously, as the thermacoil can be badly damaged by scale build-up. The Infuser comes with some cleaning tablets, and if scale seems to be a problem, you may want to pre-filter the water you use in your machine instead of just relying on the filter that comes with the machine. One reason the Infuser is so popular is that it gives a budding home barista as much or as little help as he or she wants. Pressurized filter baskets are more tolerant of imperfect grinds and inadequate tamping, giving you a consistent shot even if your skills in these areas are still developing. You can also pre-program single or double shots if you’re not yet able to time them manually. Perfecting your grind and tamping technique with a non-pressurized filter basket will allow you to customize your shots in a way that pressurized baskets never can. Best of all, this machine lets you choose. If you want to practise improving your skills, you can use non-pressurized baskets and override the volumetric programming. On the other hand, when you have 10 guests over for brunch, you may prefer to fall back on the dummy-proof options the Infuser offers you. 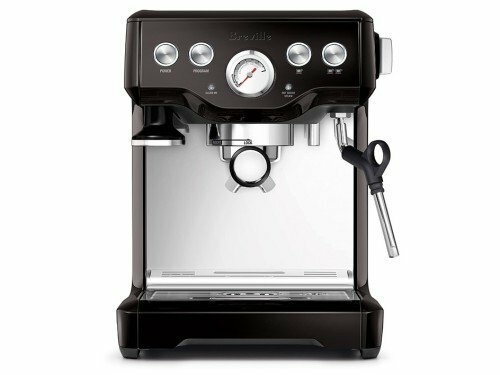 All in all, the Breville Infuser is one of the most popular home espresso machines in the mid price range currently on the market. It is an attractive and reliable machine with plenty features for your convenience. Whether you’re new to pulling espresso shots or a practiced barista, you will be able to get great results with this machine. In this price range, you really can’t do better. This espresso machine costs a bit less than the Infuser. It works best with non-pressurized baskets, making it a good choice if you’re already an experienced barista. The machine claims to be compatible with pods, but this feature doesn’t appear to work very well. Some people also recommend replacing the steam wand with a better one – an inexpensive upgrade that will give an experienced barista a great piece of home equipment at a very reasonable price. This machine costs over $500, but it includes a conical burr grinder. 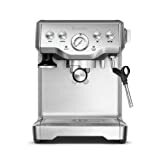 If you don’t already have a good grinder and are looking to buy one, this can be a good pick as it come under the same hud as the Breville Infuser Espresso Machine. Otherwise, the Barista Express offers all of the same benefits that you get with the Infuser. It has a similar style and appearance, although the built-in grinder means it will take up more space on your counter. 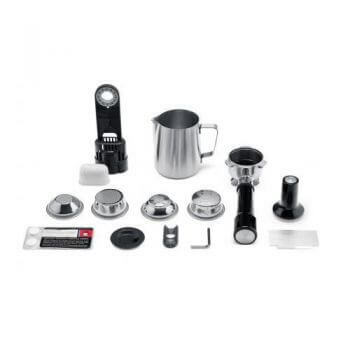 Again, this machine includes many of the same accessories you get with the Infuser: magnetic tamper, milk pitcher, cleaning tools, and pressurized and non-pressurized filter baskets.